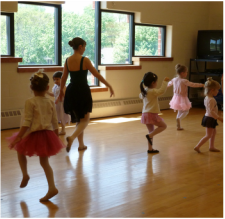 ​﻿Summer ballet classes help dancers to keep up with their skills over the long break before the new dance season begins. They are also a great way for dancers new to ballet to get started! Classes meet Monday through Friday for one or two weeks depending on level. Schedule is subject to change based on enrollment. Classes and Intensives with low enrollment may be combined. New and returning dancers are welcome! 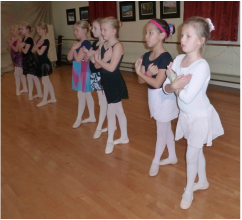 Class will include stretches, basic ballet steps, and fun dances that incorporate the skills learned in class. Dancers should follow the studio's dress code, but hair may be in a ponytail instead of a ballet bun for this class. New and returning dancers are welcome! Our theme for Summer 2018 is "Flexibility, Strengthening and Choreography". As such, classes will have an extended stretching and strengthening component in addition to normal barre and center work set to fun music. Classes will also have short choreography components - both to work on skills needed to pick up patterns quickly, as well as to create their own patterns set to specific music. Dancers should follow the studio's dress code, but hair may be in a ponytail instead of a ballet bun for this class. * 2018-2019 Ballet 3 dancers may be placed on a waiting list for this class. If there are spaces available on July 1, Ballet 3 dancers will be added from the wait list. Dancers must sign up for and take the Intermediate Intensive to qualify. *Adult dancers with previous experience may attend the Advanced Intensive. Teen Dancers who are new to ballet may take the Beginning or Intermediate Intensive. *Adult dancers who are unable to attend the full session may drop-in to single classes at a rate of $17, space permitting. Please register for Open Adult.